Settled by Mormon pioneers in 1847, ceded to the U.S. in 1848, and finally recognized as a state in 1896, Utah has one of the most unique histories of any state in the union. It’s also home to some stunning natural landmarks, peculiar customs, and settings that should be familiar to anyone who’s a fan of Westerns. Here are 25 things you might not know about the Beehive State. 1. Utah is where you can find one of the heaviest organisms on earth. The Trembling Giant, or Pando, in the Fishlake National Forest, is made up of 47,000 genetically identical trees that share a single root system. In addition to being notably massive, it’s also among the oldest organisms on earth—it's been alive for more than 80,000 years. 2. According to the state’s license plates, Utah boasts “The Greatest Snow on Earth.” This claim is based around the notion that the snow is supposedly lighter and drier than what’s found in other states, which lends itself well to deep-powder skiing. Research has shown that while Utah’s dry, fluffy snow may not be unique to the state, the high amount of snowfall that hits its top ski resort has helped to boost its reputation. 3. The town of Levan (which is "navel" spelled backwards) is located in the middle of the Utah. According to local lore, the town got its name because it sits at what would be the belly-button of the state, although the official story goes that Brigham Young picked out the tag. 4. Philo T. Farnsworth, the man best known for inventing a prototype of the first all-electric television, was born in Beaver, Utah in 1906. His love of tinkering was apparent from a young age. As a teenager, he converted his parents’ home appliances to electric power and won a national contest by inventing a magnetized car lock. He first sketched out his concept for the vacuum tube that would later revolutionize television in his high school chemistry class, but it was brushed off by his teacher and classmates at the time. 5. In 1869, the nation’s first transcontinental railroad was completed in Promontory, Utah. Construction on the project began in Sacramento to the west and in Omaha to the east and took seven years to build. 6. The Bonneville Salt Flats comprises 30,000 acres of desolate, densely packed salt pan. The spot’s incredibly flat and smooth terrain makes it a popular destination for speed-seeking land racers. In 1964, a man named Norman Craig Breedlove broke the record for longest continuous tire skid when he lost control of his jet-powered Spirit of America on the flats. The resulting skid marks stretched 6 miles long. 7. Loftus International, a family-run novelty company in Salt Lake City, sells between 10,000 and 20,000 rubber chickens each year. 8. The official state cooking vessel of Utah is the Dutch oven. Like the ax and the rifle, these cast iron cooking pots would have been considered precious necessities by westbound pioneers coming to the state in the 19th century. Utah recognized the Dutch oven as an official state symbol in 1997. 9. Utah is the only state where every county contains some part of a national forest. 10. Sixty percent of Utah’s population is Mormon (compared to just 2 percent of the American population overall), making it the most religiously-homogeneous state in the nation. This comes through in many aspects of the state’s culture, their unique liquor laws being one major example. Newer restaurants in Utah are required to erect an opaque barrier or “Zion Curtain” around their bars to keep children from seeing alcoholic drinks as they’re being prepared. 11. Walter Fredrick Morrison, the man credited for inventing the Frisbee, was a Utah native. The inspiration for the idea came from tossing tin cake pans back and forth on the beach with his future wife. He began manufacturing “Pluto Platters” of his own in 1948. 12. In 1847, seagulls helped save the lives of pioneers by consuming swarms of crickets that threatened to wipe out their crops. The event was dubbed the “Miracle of the Gulls” and in 1913 a monument depicting two bronze seagulls perched atop a granite column was erected in Salt Lake City’s Temple Square to commemorate the event. The California Gull has since been adopted as Utah’s official state bird. 13. Utahans eat twice the amount of lime green Jell-O as the rest of the population. A popular way to consume the sweet treat in Utah is to add shredded carrots to the mix. 14. The Utahraptor, one of the largest raptors ever known to exist, was discovered in Utah and named after the state. At around 18 feet long, it would have more closely resembled the raptors depicted in Jurassic Park (1993) than its measly cousin the Velociraptor. It was almost named after the movie’s director, but the paleontologist who discovered it was unsuccessful when he proposed the idea to Spielberg in exchange for fieldwork funds. 15. The location of the first-ever KFC wasn’t in Kentucky, but 1500 miles west in Salt Lake City, Utah. The iconic fried chicken recipe was first served in the cafe of Colonel Sanders's friend (and Utah native) Leon W. "Pete" Harman. While paying a visit to his friend’s home in Salt Lake City, Sanders was able to convince him to put the chicken on his menu at the Harman cafe. Harman agreed, and when Sanders returned to Utah a few weeks later he found customers lined up down the street waiting to taste his product. His success at the Utah location inspired him to continue licensing his chicken recipe to restaurants across the country. 16. Utah’s Arches National Park is known for containing more than 2000 natural sandstone arches. In the past, hikers who have discovered undocumented arches have been given the honor of getting to name them. 17. 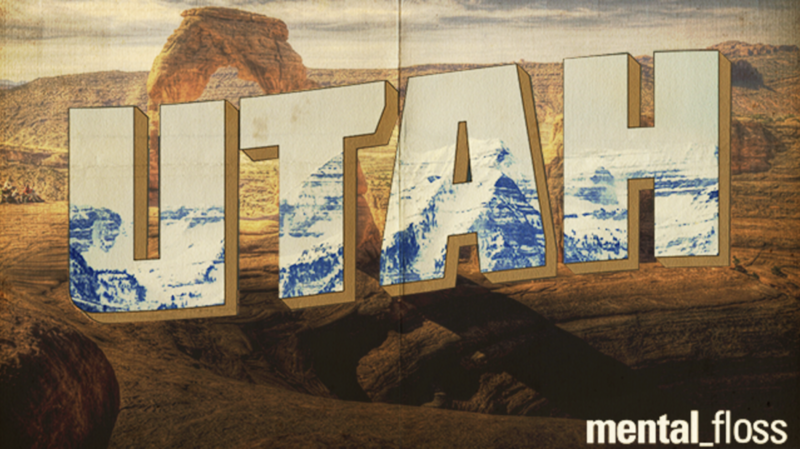 Utah is the only state whose capital is three words long. At one point it was even longer: Salt Lake City was originally named “Great Salt Lake City” for its proximity to the Great Salt Lake, but they decided to drop the “Great” in 1868. 18. If your vision of the Old West is informed by films and shows like Stagecoach, The Lone Ranger, and Gunsmoke, you’re likely picturing Kane County. It’s often referred to as “Little Hollywood” because it’s served as the backdrop for dozens of Westerns over the years. You can go here to check out the full list (non-Westerns like Arabian Nights and the original Planet of the Apes were also filmed there). 19. It’s illegal to modify the weather in Utah—at least without a permit. The Utah Administrative Code defines weather modification or “cloud seeding" as, “All acts undertaken to artificially distribute or create nuclei in cloud masses for the purposes of altering precipitation, cloud forms, or other meteorological parameters." 20. The Uintah County Library houses a collection of handmade dolls modeled after every U.S. First Lady up to Nancy Reagan. 21. Utah lays claim to one of the biggest man-made pits on earth. About a 30 minute drive from Salt Lake City, the Bingham Canyon mine has produced 18.1 million tons of copper since the Kennecott Copper Corp. began digging there a century ago. The mine reaches a quarter of a mile into the earth, making it deep enough to fit two Willis Buildings stacked on top of one another and still have room left at the top. The pit’s massive size makes it easily visible to astronauts as they pass over the state. And because Kennecott digs approximately 250,000 tons of rock from the pit every day, tourists can see the hole grow bigger with every visit (the mine is currently closed to visitors due to movement detected on its northeast wall). 22. When Jim Bridger became the first English-speaking person to discover the Great Salt Lake in 1824, he mistakenly thought he had reached the Pacific Ocean. The Great Salt Lake contains between 4.5 and 4.9 billion tons of dissolved salt. The parts of the lake with the highest salt content are nearly nine times saltier than the ocean. 23. According to a recent study conducted by WalletHub, Utah is home to the most charitable people in the country. Utah ranked first in volunteer rates among residents, first in percentage of donated income, and first in median contribution to charity. 24. Bryce Canyon is one of five national parks in the state. The most unique feature of the park are its sprawling forests of Hoodoos, or thin pillars of rock shaped by years of erosion. Nineteenth-century Mormon pioneer Ebenezer Bryce, for whom the park is named, apparently described it as "a hell of a place to lose a cow." 25. Utah was the site of the nation’s first department store. The Mormon leader Brigham Young founded the Zions Cooperative Mercantile Institution, or ZCMI, in 1868 in Salt Lake City. The 130-year enterprise finally shut down in 1999, when the Mormon Church sold the store to the Macy’s corporation.